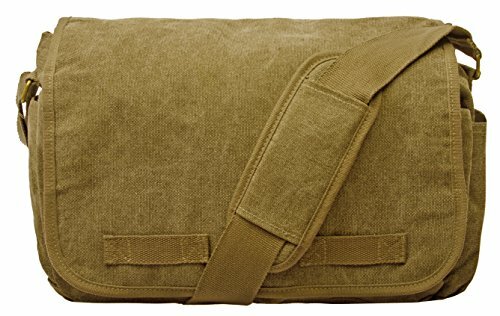 Sweetbriar Classic Messenger Bag - Vintage Canvas Shoulder Bag for All-Purpose Use by Sweetbriar at Toad Lily Press. Hurry! Limited time offer. Offer valid only while supplies last. Sweetbriar Vintage Messenger Bags offer rugged durability for modern all-purpose use. Direct-to-consumer prices allow for high quality at low cost. Sweetbriar Vintage Messenger Bags offer rugged durability for modern all-purpose use. Direct-to-consumer prices allow for high quality at low cost. Updates feature top handle for easy pick-up portability and a shoulder pad for additional comfort. Dimensions: 17.5 x 12 x 5". Weighs only 1.2 lbs. Easily fits all laptops 13", 14", and up to 15.6". Includes a 1 year Limited Warranty. If you have any questions about this product by Sweetbriar, contact us by completing and submitting the form below. If you are looking for a specif part number, please include it with your message.